Now make the eyes and eyelids. You want to sew those in place before you put on the hair pieces. sew the larger hair pieces on first. 1 on each side of eye, and one front and center above the eyes and 1 in the back center. Sew around the edges leaving a small gap at top for stuffing. Stuff then sew the gap closed. Insert a long strand of yarn about the quarter of the way from bottom of hair piece and wrap it across to the other side, go back into the head and back out from where you went in. Pull the yarn tight to cinch it. Do this about 3 times for each hair piece. 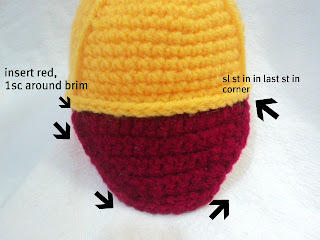 sew the smaller pieces over the gaps in between the larger pieces. Follow the same steps as above. 2) 2sc in each st. sl st to next st and F/O. Hot glue or sew it to the top of the hat. We are a Veggie family here, and I can't wait to make my son's favorite, Junior! Thank you so much for sharing these awesome patterns. You are very talented! 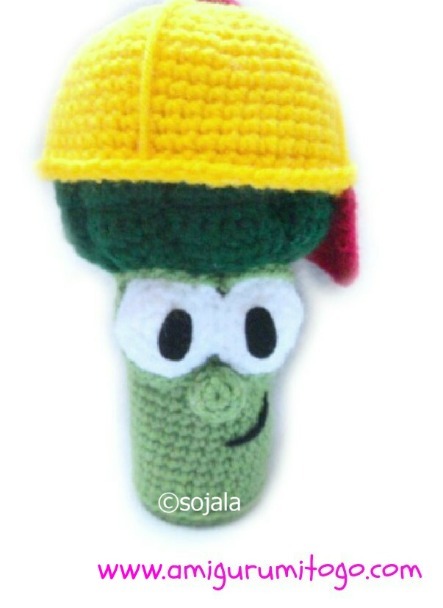 Our family LOVES Veggies! I have grandkids, but my children (26 & 23) will want their own set! I had better get busy! That's great Nan! Have fun and all the best to you and yours in 2012!! I am so excited that I came across these. Thank you so much for sharing them. We all LOVE Veggie Tales and I know that my boys will want these. Thanks again for sharing! !